Has anyone ever told you that your writing though well written was kind of dry? Did it sound like the smooch of death? The first time I heard this about my own work, I was struck dumb. What is dry writing and how do I fix it? I discovered that dry writing means that I was lacking emotions in my scenes. If there are no emotions in your scene then your reader can’t connect with your hero or heroine. In other words, your reader isn’t going to care about your characters. And that my friends, is the smooch of death. Megan rolled a large log with one foot then the other, until it was near the bonfire. “God, this thing is heavy.” With a grunt, she lifted one end until it teetered upright then gave it a shove. It landed in the fire, embers swirling in the air. Last night’s violent storm had made a mess of her meager campsite, which had taken all morning to fix, and had demolished her seaweed SOS sign. She’ll have to recreate her SOS. Sighing, Megan trudged toward a pile of kelp. As she got closer, she saw a figure wearing blue jeans and a t-shirt. Oh, God, it’s another body washed up from the plane wreck. That would be number twelve. As always, she couldn’t help but wonder if the next one would be Jonathan. He hadn’t been wearing jeans on the plane, so she knew she’d been spared seeing his corpse this time. Thank God. She approached the body with dread. Suddenly the “dead body” coughed and rolled over. With a scream, Megan jumped back. There isn’t anything technically wrong with the scene, but it lacks an emotional punch. You don’t really care what happens to the heroine, because in this scene you can’t connect with her on an emotional level. If she had to spend one more day on this godforsaken island, she’d go stark raving mad. The thought spurred Megan into rolling a large log with one foot then the other, until it was near the bonfire. “God, this thing is heavy.” With a grunt, she lifted one end until it teetered upright then gave it a shove. It landed in the fire, embers swirling in the air. Breathing hard, she flicked a glance at the teal-colored sea. She’d thought a vacation to the Bahamas would be the perfect getaway, would be a solution to the problems she and Jonathan had faced. She’d been wrong—dead wrong. Tears of grief filled her eyes. The never-ending crash of the waves on the beach and the cries of the seagulls seemed to mock her with the reminder she was utterly alone. She’d felt like a tiny speck of sand last night when a violent storm had swept across the island. It had made a mess of her meager campsite, which had taken all morning to fix, and had demolished her seaweed SOS sign. She’ll have to recreate her SOS. Sighing, Megan trudged toward a pile of kelp. As she got closer, she saw a figure wearing blue jeans and a t-shirt. Her stomach lurched. Oh, God, it’s another body washed up from the plane wreck. That would be number twelve. As always, she couldn’t help but wonder if the next one would be Jonathan. He hadn’t been wearing jeans on the plane, so she knew she’d been spared seeing his corpse this time. Thank God. She approached the body with dread. Tightening her resolve, she knelt. Suddenly the “dead body” coughed and rolled over. With a scream, Megan jumped back. She clutched her chest and pressed a shaking hand to her mouth. As you can see adding emotions makes the scene come alive. Windswept Shores is back, and better than ever with a replaced missing scene. It’s something warm to read while it’s frosty outside. And better yet, there a sequel too. Blurb: The sole survivor of a plane crash, Megan is alone on a deserted island in the Bahamas. Then she finds a nearly-drowned man. Another survivor, this time from a boat wreck. With only meager survival skill between them, will they survive these windswept shores and can they find love? His hand lingered on her shoulder. Her trembling vibrated up his arm. Blimey, she’s all shaken up. “S’kay, she’ll be right.” He grabbed her sleeping pallet, pulled it over, slipping an arm around her waist. “Or like yer husband if that’ll help?” He grinned in the dark, wondering what kind of reaction he was going to get. “I noticed you weren’t wearing a wedding ring. Is it because yer husband drowned?” His heart beat a little faster when he asked the question. He really wanted to know if he had a chance with her. “How old?” he asked. They must be missing their mum, poor little nippers. “Twenty-three years this January,” she said. “How old are you?” He positioned his head where he could breathe in the scent of her hair, and inhaled a floral fragrance. How does she manage to smell fresh in a place like this? “Not where I’m from, so spill.” He scooted up some, placing his knees behind hers. “You’re still spunky.” He wondered how far she’d move until she ran out of room in her tiny shelter. “Uh, spunky, thanks.” Megan rolled onto her back. Blimey, she out maneuvered me. Seth was forced to move back, but kept his hand on her tummy. “You got hitched when you were a young ‘un?” He quickly did the math. She’s a bit older than me. More of a challenge. “What happened?” she asked. Her bed rustled as she shifted position. “We got into a blue, she told me to shove off, so I left. So that was the end of that.” His hand drifted to her rib cage. “Any kids?” she asked, pushing his hand down. “I’m starting to feel it when I surf,” he admitted, smoothing a wrinkle on her shirt. Blurb: Megan and Seth are finally rescued off their little island, but things are far from idyllic. Seth is arrested for murder, and Megan is order to return home to her philandering husband who is somehow still alive. Will they ever get back together again or see the life they envisioned? “Megz, I thought you were going home?” Seth chided as she took the seat across from him at the old beat up wooden table. “I have a flight in two hours. Time enough to see you before I leave.” She blinked back tears. This is so unfair. This can’t be the last time I see him. “I did.” She sighed and looked down. I’m not sure what good it’ll do, Seth. “Not much to go by.” Seth rubbed his thumb across her knuckles. “No, just me.” She tried to smile. “And old Bill who’s gone.” He lifted her hand to kiss her fingers. “Times up,” said a guard. Megan stood and stared at Seth wanting to remember him. Not like this in the black and white jail clothes, but the way he was on the island, happily rumpled in his threadbare outfits. My name is Janice Seagraves. If you were looking for the Easter blog hop tour then you’ve come to the right place. In my book, Windswept Shores, I used a deserted island in the Bahamas to set the scene for my couple. I did a lot of research to describe it accurately. The island and the weather itself became almost a secondary character. As for the rest of their adventures, I relied heavily on my own background to fill it in. You see my dad loved to fish. I mean he really loved to fish. 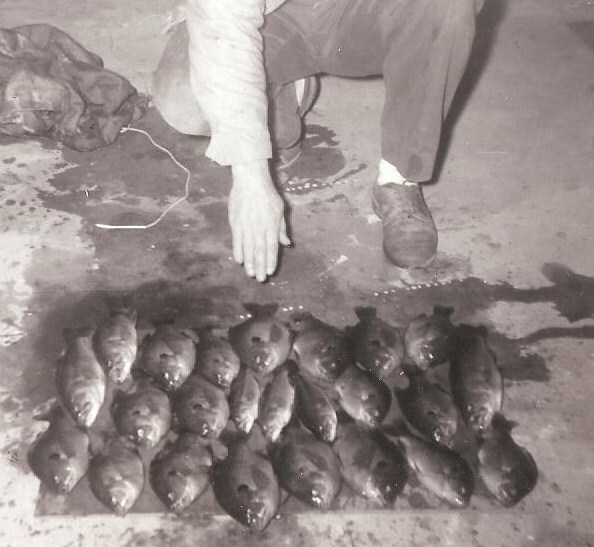 This photo was taken back in the day when there was no limit on fish caught in a lake. I think these fish were caught in Exchequer, CA. 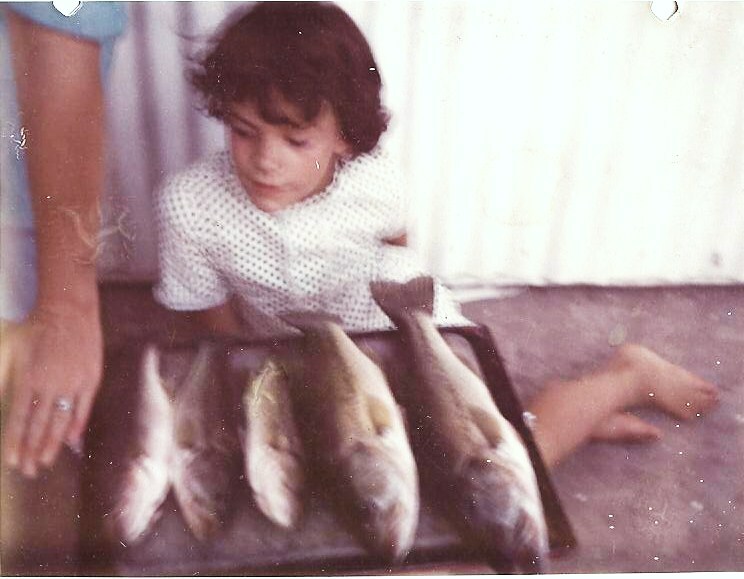 The little girl in this photo is me, admiring my dad’s catch (I loved my daddy). My dad fished all year round. But Easter week was the time for our little family to go on the first camping trip of the year. On the Friday, the last day of school before Easter break, dad and mom would load up our car or truck (if we had one that year) and he’d hook up his boat (dad always had a fishing boat ), then dad would take us all camping. We never knew where he’d take us. It could be someplace new or maybe an old favorite like Don Pedro Lake, but wherever it was it would be a place where he’d probably heard the fishing was really good. He’d also talked to fishermen to find out what the fish were hitting that season, since it did seem to change from year to year or season to season. 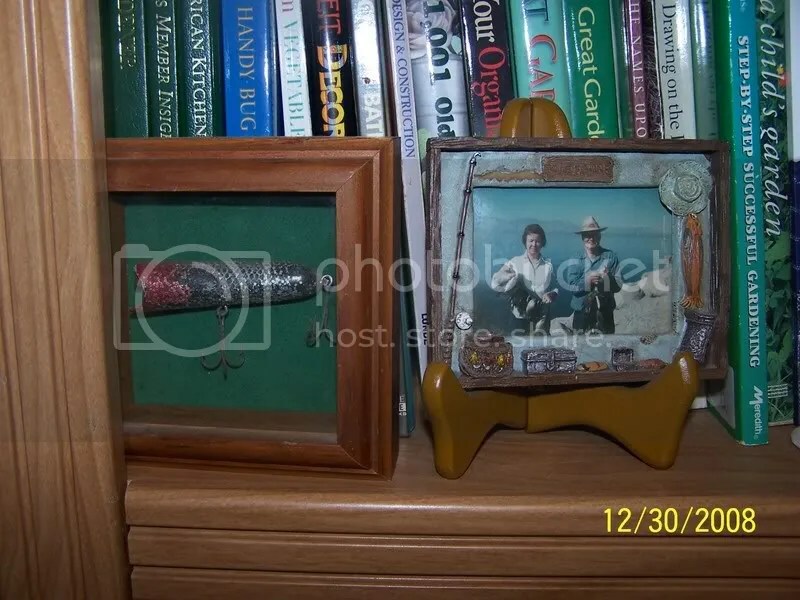 Dad also made his own lures, but he didn’t limit himself to their use. He had a big tackle box full of lures and, well, tackle. He also raised red worms and at one time he raised minnows too. My dad caught so many fish that my mom, in self-defense, had to learn to cook them and got really good at fish frying . We ate so much fish that I thought I’d grow gills, lol. Most of Windswept Shores revolves around my hero and heroine basically camping out on the beach. Which I got from my dad taking us camping and we camp along the shores of various lakes as I grew up. I was nearly born at a lake. My mom was very late in her pregnancy with me when he wanted to go fish and camping. My mom said no, but my dad was persistent. Luckily my mom won that argument. My father’s gone now, he passed away in 1982 from colon cancer. 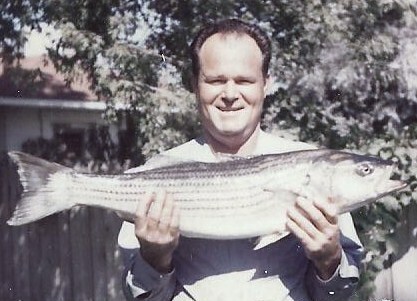 I still miss him, but as a salute to my dad, I made, Seth, the Aussie hero in my story to be something of a fisherman. He’s also the first mate on the Dinki-Di before it got reefed. “Isn’t that an Aussie term?” she asked, wrinkling up her brow. “It’s just an expression, luv. Like I’m a dinki-di, Aussie,” he said, pointing to himself. She patted the side of his face. “Hey, are you okay?” That’s a dumb question. He isn’t okay. “Hello there.” She hated the sound of her voice. It sounded rusty, unused. Abruptly he rolled away from her to heave onto the sand, making a loud, ugly retching noise. His accent intrigued her. Was he English or Australian? “Ya smell too good not to.” He grinned, causing his cheeks to dimple. “Name’s Seth Dawson.” Leaning back on one arm, he stretched out his hand to her. She clasped it as if it was just a friendly greeting between strangers back home. Megan wrapped her arms around his neck. Their gazes met, turning intense. She felt like she could drown in his warm gray eyes. He leaned in and pressed his full lips against hers. The kiss tingled, going right through her, making something lower down tighten and beg for attention. “Do what ya can, then we’ll eat onboard the Dinki–Di.” He tossed her a lighter. She caught it. “Okay, but I’ll need a boost to get back up.” She pointed to her campsite. Scooping her up, he gave her a toss. Megan landed neatly on her feet next to the tree. “There isn’t anything dull about you,” Megan said without thought. “Show ya later.” He grinned devilishly, showing every tooth in his head. “I had to open my big mouth,” she muttered. He’s back to flirting. But she found she had missed that, too. I had a guest post on Amber Skyze’s blog.